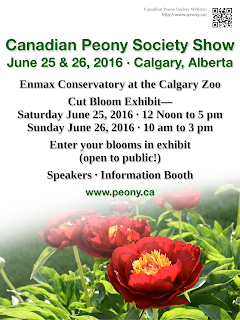 The Canadian Peony Society’s National Peony Show will be held in Calgary, Alberta June 24 – 26, 2016. It is at the Calgary Zoo and Botanical Gardens in the Enmax Conservatory. 1. The show is open to any member of the general public upon paid entry to the Calgary Zoo. 2. All entries must be placed by 8:15am Saturday June 25, 2016. 3. Containers will be provided. 4. In each class you may place up to 2 different cultivars. 5. Each entry must have an entry tag with your name address and phone number. Entry tags will be provided. 6. All plant material must be grown by the Exhibitor. Peonies should have stems 10-12” with top leaves only. 7. The decision of the judges is final. The judges may withhold an award of the exhibit is not deemed worthy. 8. Ribbons will be awarded for 1, 2, 3, 4th place. “Court of Honour” and “Grand Champion” will be also awarded. 9. The Canadian Peony Society and the Calgary Zoo assume no responsibility for loss or damage. 10. Go to peony.ca for more information. One of the best ways to increase our membership and inform interested people about the wonderful improvement in peony culture is to invite them into our gardens. I encourage you to consider participating in the Canadian Peony Society 2016 " OPEN GARDENS" program. We have been pleased in the past to offer members the opportunity to visit gardens all across Canada. Feedback indicates that those members who invite their local garden club to visit, and/or had a few special publicized open days were more successful in welcoming guests. If you have a Red Hat group in your area, chances are they would be thrilled to be invited. I notice that Carol Adelman is having a special "Red Had Day" at her nursery outside Portland, OR and I have shamelessly copied her idea! Contact Holly at hplove8@telus.net with any questions about the program, and to indicate any changes you may wish make to your listing. New listings welcomed. Please forward this email to members in your area, or anyone with a beautiful peony collection. As we are going to be listed on the website, www.peony.ca, we are entering a whole new world. We may start hearing from people who are very curious about peonies. One never knows. In addition, I will be creating a Private Gardens and Public Gardens listing, so that those who charge a fee can make that quite clear... . Would you please forward information about Public Gardens in your area, with contact information so I may contact them? ps. Darlene Kalawsky and I are working with the Doukhobor Discovery Centre, Castlegar, BC for the possible development of a Memorial Peony Garden at their museum. We started with a kind donation of peonies through the Prairie Peony group, Brian Porter and friends from Indian Head, Saskatchewan in the fall of 2015. We would be delighted to have feedback from anyone else who is will to donate some roots this fall. We are just creating a list of possible donors at this time, as the Board of Directors have not yet given us the 100% approval to enlarge their gardens... we will be in touch with anyone who responds to our request. thank you.